San Pancrazio airfield (Italian: Aeroporto San Pancrazio, also known as Sanpan airfield) was an airfield northeast of San Pancrazio, in Brindisi province, on the 'heel' of Italy. It is not known when the airfield was built, but it is possible it already existed prior to the Allied invasion of southern Italy in 1943. After the airfield's location was liberated, United States Army Engineers constructed the airfield as we know it today. Once finished it became a fighter and medium bomber base. The first unit to use the new facilty were 82FG between 3 and 10 October 1943, flying P-38. They were followed by a medium bomber wing (340BG) on 16 October, which flew B-25 Mitchells and remained at the airfield for little overe a month (19 November 1943. 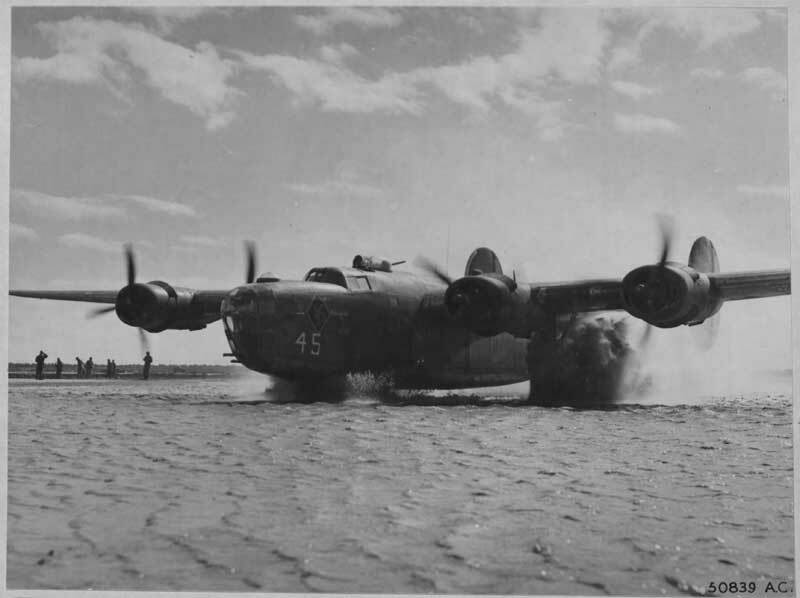 A few days before the Mitchells left their replacements flew in: B-24 heavy bombers of 376BG which remained until they disbanded in November 1945. Between 5 March and 6 April 1944 they were joined by another B-24 Group: 451BG. The heavy bomb groups flew missions all over southern, eastern and middle Europe. 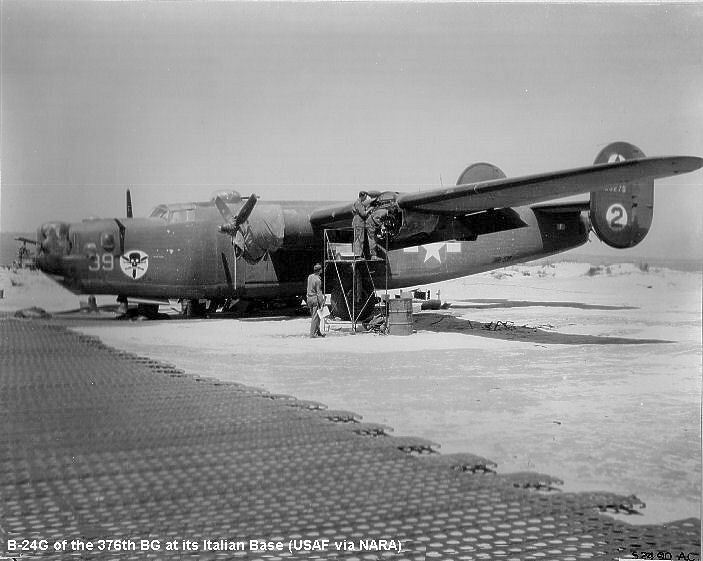 As 376th was based at San Pancrazio, this B-24G is parked at one of that airfield's dispersals. Note the PSP plates steeply drooping off at the edges (Wikipedia). It is not clear what happened to the airfield after the Americans left. Some sources claim the airfield was possibly used as San Pancrazio Airport, but I could not find anything (in English or Italian) to substantiate this. The use as an airport would explain the presence of a hardened (concrete? asphalt?) stretch of the runway, at 1300meters about a third shorter than the original wartime runway, visible from aerial photoghraphy (Google Earth). The runway is unusable today however, as multiple buildings seem to have been placed on and immediately next to the runway. Most of the land seems to have been converted back to agricultural use. 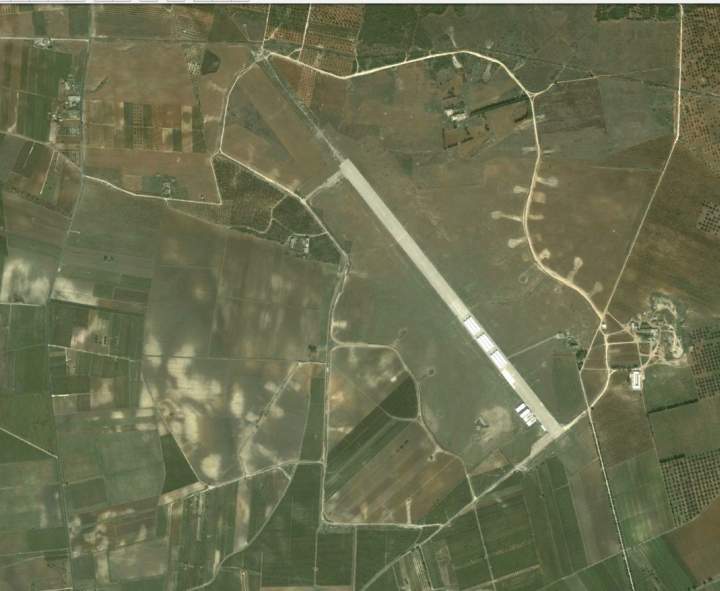 Still, the airfield is one of the better preserved wartime airfields in Apulia, with the runway, taxiways and dispersals clearly visible. Guido Surci and his son Giacomo went to the airfield in the Summer of 2011 and reported: "The Airfield is currently closed by a modern fence: signs on it identify the Airfield as a UN (United Nations) base, although it seems there has not been any activity for years. The base is probably linked to the Brindisi Papola Casale Airport, which has a huge section of it used as warehouse and parking lot for UN materials and vehicles. I was not able to enter the airport but from outside you can see some white temporary warehouses. I say temporary as they do not seem made of concrete (...). The pathways circling the airstrip you can see from the aerial view are outside the fence. Coming from the south I was able to drive almost to the northern tip: seems easy from the photo but in realiy it's just a grass strip without wineyards and olives. I guess there is some concrete just a few centimeters below the grass, that's why local farmers never planted anything in there." Mille grazie, Guido and Giacomo for your information!